★Fish Filter and Easy to Use：The fish filter is easy to spin off, install and clean after using. You can put anything you like inside, just like coffee sugar, scented tea, fruit tea, green tea, herb tea, slim tea, flower tea, salad juice and so on. ★Creative Design: Amazing home decoration，Send it as a gift , all kinds of people will love this cute cat. The filtration system uses very fine holes to allow only water into the cup, holding on to your tea leaves and preventing you from drinking scented tea with leaf debris. ★Size：Cat tail the tea cup size is 3.2 * 3.2 *5.5 In hand size, manual measurement, The Capacity of cup is about 12.7oz (250ml), middle size. 5 X 3.4 X 4.7 In Paper box with A Cat Tea Cup, perfect gifts for your family and friends. 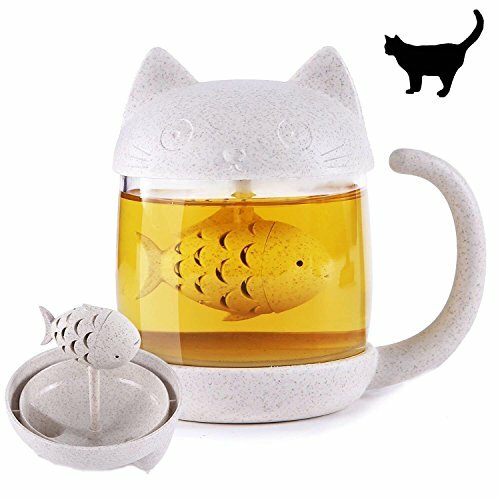 ★Best Gift：This unique mug design is perfect as gift for your friends or families, especially for cat lovers. This product supports 60 days unconditional return, 120 days renewal service. Every order is backed by a 100% life time, no questions asked, guarantee. Purchase with total, risk-free confidence.